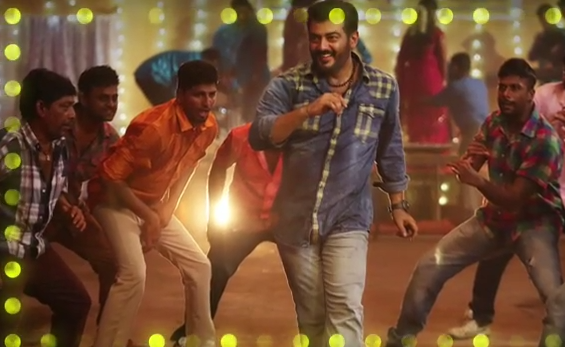 The much-awaited "Adhaaru Udhaaru" track from Ajith-starrer "Yennai Arindhaal" has been released. The trio thala Ajith, Gautham Vasudeva Menon, and Harris Jayaraj are coming together for the first time with a leg tapping folk number which is sure to make you sway to its tunes. Listen to Adhaaru Adhaaru from "Yennai Arindhaal" featuring Vijay Prakash and Gana Bala. Thursday is considered as lucky day for the film's producer, and so far the first-look posters and the teaser of "Yennai Arindhaal" have been released on Thursdays. Now, the most-anticipated intro song has also been released on a Thursday. Interestingly, the film's teaser will be out on theatres on the same day. Following the grand response for the film's posters and the teaser, there are huge expectations from the audio of "Yennai Arindhaal." Harris has received positive feedback for the background score of the film's teaser. Whether the composer will be able to impress fans with the "Yennai Arindhaal" album or not is something one needs to wait and watch. There will be six tracks in the album including Ajith's intro song and a solo song featuring Trisha. The film's music is expected to be launched later this month. Sony Music South has snapped the audio rights of the film. Trisha and Anushka play the female leads opposite Thala. While this is Anushka's first film with Ajith, Trisha will be seen romancing the actor for the fourth time after "Kireedam," "Ji" and "Mankatha." Arun Vijay, Vivek, Rajasimman, Parvathy Nair and Thalaivasal Vijay are also part of the film's cast. The film produced by Shri Saai Raam Creations is likely to hit the screens on 15 January as a Pongal treat for the fans. The Ajith starrer is likely to clash with Vikram's "I" and Vishal's "Aambala" at the box office. Pongal has turned out to be a lucky period for Ajith with "Veeram," which hit the screens in January 2014, turning out to be a successful one. The actor is going through a good phase with his last two releases, including "Arrambam," having performed well at the box office. It will be interesting to see if "Yennai Arindhaal" repeats the success.